Try something new this week. Start by planning five to seven meals that your family enjoys. It’s dinnertime and your family is staring hungrily at you from the dinner table. “What’s for dinner?” your kids ask. You look deeply into the refrigerator for something to serve your family. Sound familiar? With today’s busy schedules, families often do not think about what’s for dinner until it’s time to eat. Wouldn’t you like to come home from work, grab a home-cooked meal from the freezer, pop it in the oven and come back an hour later to a tasty dinner? Maybe Monday night can have a Mexican theme, and you will serve tacos. Plan a simple meal for busy nights. Once you have your meals planned, set one chunk of time, maybe Sunday afternoon, as your “cook-all” time. Cook and season the ground beef for your tacos, and cook and cube chicken breasts for your chicken and rice casserole. Then, freeze the chicken in a freezer-safe container or zip-close bag. On the day that you’re having chicken and rice casserole, pull out the chicken and you’re ready to go. Taking time ahead of schedule to do somewhat time-consuming tasks such as these will make dinnertime during the week less stressful for you and much more enjoyable for your entire family. Freeze casseroles before baking, especially when all ingredients are cooked. When preparing a meal for the freezer, undercook starchy ingredients, including potatoes, rice and pasta. Freeze meals in portions just right for your family. Or freeze meals in individual portions for quick lunches. Freeze meals in the container you plan to use later to bake or microwave the meal. Glass containers work well. Avoid freezing meals that include items that don’t freeze well, such as boiled eggs, sour cream and mayonnaise. Question: As a family, we are very busy. We only eat as a family on the weekends. How can we find each other at dinnertime more often? First, give yourself a pat on the back! Dinnertime together on the weekends is a great way to start. 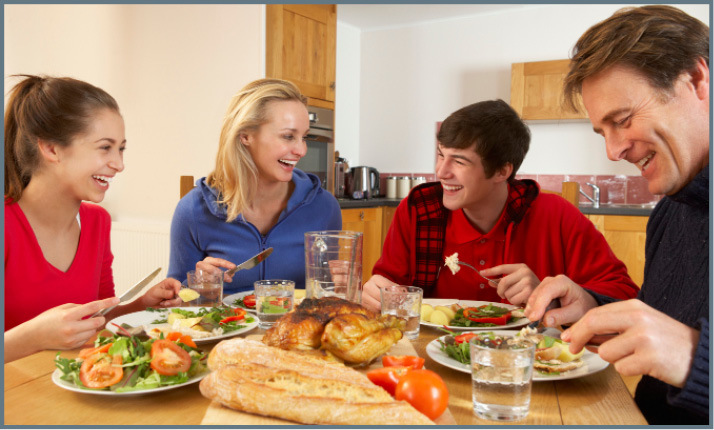 The most important aspect about family mealtime is being together as a family. So, if you can’t all get to the dinner table every night of the week, try something different. Place everybody’s favorite cereal box on the table before bed tonight. Set out the bowls, glasses and spoons. Tomorrow morning, settle in for a stress-free family breakfast. Family meals are about being together, not about elaborate meals. Also remember that all family members need to be flexible. If you must, write down on the calendar that every Thursday (or another day) you will have dinner together as a family. Try this make-and-freeze recipe. Try these meatballs with pasta and spaghetti sauce, too. Place ground beef in a large bowl (or use a mixer) and mix in the egg. Next, using clean hands, add the oats and mix thoroughly. Pour in the evaporated milk, seasonings and onion and continue mixing until the beef mixture is combined well. Form beef mixture into 32 1-inch balls (or use a small scoop). Place balls into a sprayed baking pan and bake at 375 F for 20 to 25 minutes, until they are brown and reach an internal temperature of 160 F. Serve immediately or freeze in meal-sized portions in zip-type bags. Makes eight servings, four meatballs each. Each serving has 170 calories, 5 grams (g) fat, 20 g protein, 11 g carbohydrate, 2 g fiber and 95 milligrams sodium. Quick Tips: Use shortcuts. When you’re chopping veggies, such as onions or celery, for one casserole, chop enough for another casserole or soup. Store the veggies in air-tight containers or zip-top bags in your refrigerator. Invest in some time-saving equipment, such as a small scoop for making meatballs.